Be taken to the farthest reaches of this mysterious land as you wine and dine beside panoramic vistas. 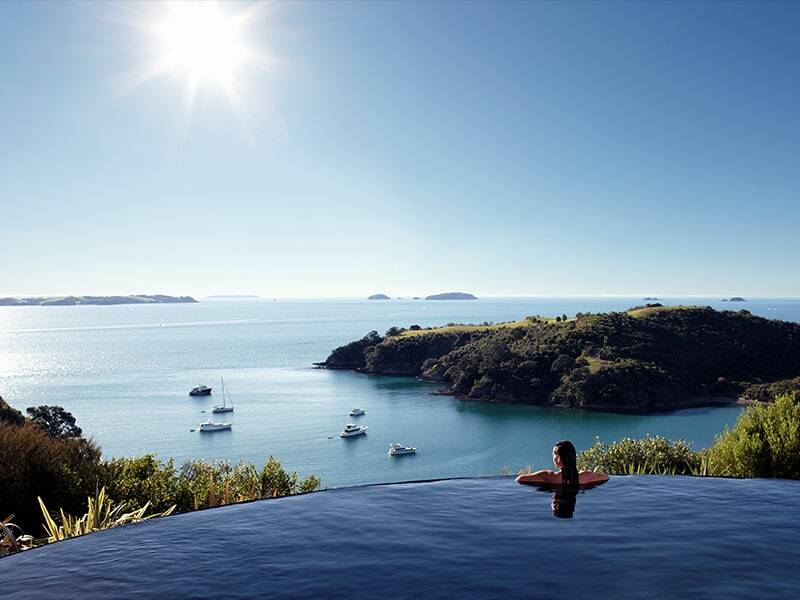 Luxury in New Zealand brings you deeper into Kiwi culture than you thought possible. Jet off on a helicopter ride over Milford Sound, relax and unwind in beautiful Wairarapa and marvel at the majesty of Canterbury. Luxury lodges, set next to picturesque backdrops are in store for you as you traverse this one-of-a-kind country in style. You will be met by your driver outside the customs and immigration area. You will be transferred to your Auckland city accommodation. Auckland, ‘City of Sails’, located between two stunning harbors, enjoys a mild year-round climate. Auckland is the country’s most visited region and largest urban area, offering exciting activities and great shopping. The city lies across a 7-mile wide volcanic isthmus separating two harbors. The Waitemata to the east opens into the Hauraki Gulf, and to the Pacific Ocean. The Manukau Harbour to the west offers many estuaries and surf beaches and opens to the Tasman Sea. Your driver will pick you up from your hotel and take you south via the rich Waikato farmlands and the city of Hamilton en route to Waitomo. Here you travel silently by boat along the underground river, surrounded by sparkling glowworms and intricate limestone formations. This afternoon you continue the journey toward Taupo, dropping off at your accommodation – Huka Lodge. Explore the park-like gardens and flower borders or soak in the hot pools. Enjoy a game of tennis on the all-weather court, or relax playing a game of petanque. A short walk beyond the gates brings you to the spectacular Huka Falls. Taupo is home to some of the finest Rainbow and Brown trout in the world. The challenge of landing one can be met with the assistance and the legendary knowledge provided by Huka Lodge’s own fishing guides. Transfer to Rotorua airport by private vehicle for your onward flight to New Zealand’s capital city, Wellington. On arrival into Wellington airport you will be met and transferred to the Helicopter pad for your flight to your exclusive lodge accommodation. The flight takes you over Wellington and then along the coastline of Palliser Bay before landing at the front of Wharekauhau Lodge – a spectacular entrance! The Wellington region of the lower North Island, which includes Wellington City (New Zealand’s capital), the Wairarapa, Hutt Valley, Porirua and the Kapiti Coast, is a vibrant new visitor destination. It is a gateway to New Zealand’s culture, both urban and rural. Essentially rural with “off the beaten track” charm Wairarapa offers a diverse experience for lovers of great wine, gourmet organically-grown food, astonishing wildlife, and natural beauty. Rolling vineyards, acres of apple orchards, fields of lavender, olive groves, heritage museums and quaint historic towns combine to make this a great destination. Characterized by small towns with strong personalities Wairarapa offers the curious a quirky look at life in the slow lane of rustic New Zealand. Experience the New Zealand outdoors or simply relax and unwind. If you wish to stretch your legs, take to a hiking trail encompassing native forest, idyllic lakes and rivers, farm land, and the breathtaking South Wairarapa coast. For the more adventurous, try a four wheel drive safari, horse trekking, or trap shooting set in spectacular rural terrain. Visit Martinborough a charming, leafy, self-styled wine village and the main center for wine touring due to the easy accessibility of its mostly small family-owned vineyards surrounding Martinborough’s village square making for a unique “walk the wineries” experience. Explore rugged Palliser Bay with unique geographical features, native seals and the Ngawi fishing village. Cruise the cafes, art galleries and antique shops of Greytown – New Zealand’s first inland town and most complete main street of original wooden buildings. Greytown maintains its Victorian village character and features a ‘living’ early settler’s museum. Enjoy the thrill of sky-diving, jet boats and 4WD quad bikes over farmland or the tranquility of hot air balloons. Find trout fishing guides and sea fishing characters or organize a scenic helicopter flight. With a blend of kiwi hospitality and warmth, visitor attractions and activities, make time for a stop in Wairarapa. You will be collected from your accommodation for a private transfer to Wellington Airport for your flight to Queenstown. Upon arrival you will be met at Queenstown airport and transferred to your lodge accommodation at Blanket Bay. Located in Central Otago in a lakeside bay, Queenstown is New Zealand’s premier alpine resort. Rich in history and abundance of recreations and a breathtaking natural beauty that lends each season its own distinct complexion, Queenstown has long been the inspiration for artists and nature-lovers from all over the world eager to capture its dramatic beauty. Nestled beside the deep blue waters of Lake Wakatipu, at the foot of the Remarkables Mountain Range, Queenstown is a year round resort, where you can be as active as you want, or just leisurely enjoy the magnificent scenery. This exclusive trip will have you picked up from your hotel and flown via the famous Milford Track & Sutherland Falls to Milford Sound where we land and allow you to absorb the beauty of Milford. We will then whisk you out to the mouth of the Sound and along the rugged West Coast where you will have the opportunity to view seals in their natural colonies. From the Tasman Sea we will fly inland over glaciers and frozen lakes to one of our secret wilderness sites for some ‘Over the Top’ hospitality. A gourmet lunch is included. This trip has been described as an experience of a lifetime and takes in some of the most spectacular scenery in the world (allow 4-6 hours for this excursion). At your leisure to explore the adventure capital of New Zealand. Set between the towering Remarkable Ranges and the bottomless Lake Wakitipu, Queenstown has it all – bungy jumping, jet boating, rafting, and amazing scenic helicopter flights. You may wish to visit Milford or Doubtful Sound or the old gold mining town of Arrowtown. You will be transferred to the airport by private vehicle for your flight to Christchurch. Upon arrival your driver will meet you and transfer you by private vehicle to your accommodation, about a 90 minute drive outside of Christchurch. From the silvery beaches of the East Coast to the jagged peaks of the Southern Alps, the Canterbury landscape is impossible to ignore. Big scenery is the order of the day – huge panoramas of ocean or mountains, great sweeps of pastureland, massive amounts of sky. It’s easy to be awestruck – but if you want to be totally flabbergasted, take a hot air balloon ride. The experience of floating across the Canterbury Plains with the majesty of the Southern Alps behind you will ingrain itself on your memory forever. Transfer to the airport by private vehicle before boarding your departure flights back to the USA.